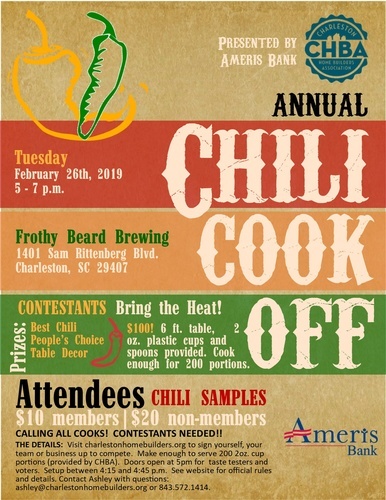 $100 to participate as chili contestant. Includes 6ft table, 200 cups and spoons. CALLING ALL COOKS! CONTESTANTS NEEDED!! THE DETAILS: Sign yourself, your team or business up to compete. Make enough to serve 200 2oz. cup portions (provided by CHBA, plus table and spoons). Doors open at 5:00 p.m. for taste testers and voters. Setup between 4:15 and 4:45 p.m. Contact Ashley with questions: ashley@charlestonhomebuilders.org or 843.572.1414. Company must be member in good standing to cook chili. Encouraged to decorate table. Please let Ashley know if you need electricity one week out. Tasting/judging from 5:00 p.m. - 6:15 p.m. Winners announced at 6:45 p.m.